As well as the detention centres in Nauru and Papua New Guinea (PNG), Australia also funds detention centres in Indonesia. It funded the Nauruan and PNG Government’s defence in cases challenging the constitutionality of the detention centres. It also funds international agencies to process and oversee irregular migrants and refugees living in the community in Indonesia, Nauru, PNG, and until recently, Cambodia. Frequently, aid funding is linked to agreements to enhance border controls, repatriate nationals who have fled the country, or establish detention centres or refugee resettlement programs. Emma Larking is a visiting fellow at the School of Regulation and Global Governance (RegNet), ANU. This post is republished with permission from Policy Forum, Asia and the Pacific’s platform for public policy analysis, debate and discussion. 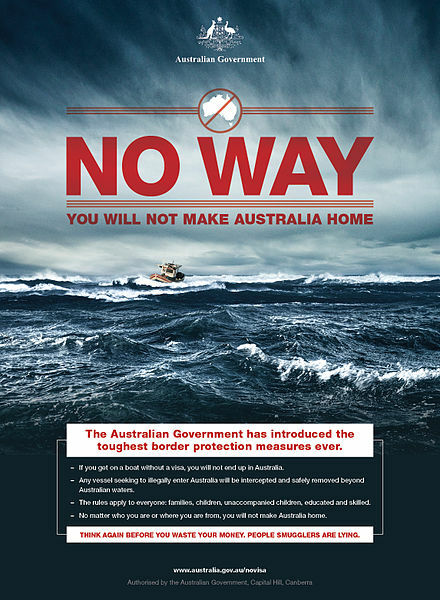 It is based on the author’s article for Asia & the Pacific Policy Studies, ‘Controlling irregular migration in the Asia-Pacific: is Australia acting against its own interests?’ Read and download the full article for free here. Emma Larking is a visiting fellow at the School of Regulation and Global Governance (RegNet), ANU. She has worked at RegNet as a research fellow, and an ARC Laureate postdoctoral fellow on Professor Hilary Charlesworth’s project, ‘Strengthening the international human rights system: rights, regulation and ritualism’. She has also worked as a lecturer in the University of Melbourne’s Schools of Historical and Philosophical Studies, and of Social and Political Sciences. Her disciplinary backgrounds are in law and political and applied philosophy. She has a PhD in applied philosophy from the University of Melbourne. Emma is author of Refugees and the Myth of Human Rights: Life Outside the Pale of the Law (Ashgate, 2014), and editor with Hilary Charlesworth of Human Rights and the Universal Periodic Review: Rituals and Ritualism (Cambridge University Press, 2014). Readers might be interested in this handy compilation of information on offshore processing from 2012 to the end of 2016, prepared by Australia’s Parliamentary Library and drawn mainly from Department of Immigration and Border Protection monthly statistical reports. It supports the suggestion above with respect to annual costs, among other things. One point that I would highlight is that of the 2017 people who have now received status determinations from the PNG and Nauru governments, 80% were found to be refugees. The proportion might well have been higher, at least after appeals, if they had been processed within Australia. A thoughtful and insightful article Emma which exposes how reckless and damaging the decisions on immigration and refugees, of successive governments involving both major parties, have been to our (Australia’s) reputation, our own record on the rule of law and probity, and our relationships with our closest neighbour PNG. It is hard to overstate the long term consequences to the relationships and to the way in which we are seen now by the people of PNG. In the same process we have probably done untold damage to PNG’s image thus potentially further damaging it economically.